Mazy May is back home and reunited with her family after spending 16 months lost in the wild. Mazy May is back home and reunited with her family in Keizer, OR after spending 16 months lost in the wild. Cissy Myers and her husband Kenneth were camping at Silver Creek Falls Park near Silverton, OR, about 30 miles from home, in July of 2012 when Mazy May went missing. The couple were staying in their pop-up camping trailer with their pets, including Mazy May, another cat a dog. They traveled with their pets because the animals got separation anxiety and wouldn’t eat if their family left them. At 7 am on the morning the Myers’ were leaving, they noticed Mazy May was missing. They think she slipped out through a small opening in a screen. “It was not zipped tight and that was the only way she could have gotten out,” said Myers. The couple searched for the missing cat, notified the park staff and put up fliers. Cissy figured that Mazy May might not come out of hiding for anyone but her, so she returned to the park and the camp site repeatedly, looking for her and calling her name. After a month, she gave up her search, brokenhearted. When Cissy got a call from Silver Creek Falls Park ranger Martha Duckworth a week and a half ago, she thought Martha was going to tell her she was closing out the missing pet case on Mazy May. She was stunned to learn that Martha was calling about an unfamiliar cat she had recently seen at the park that she thought might be Mazy May. The cat was indeed Mazy May. “When they called, I was just shaking. I called my husband and said, ‘This can’t be!’ ” said Cissy Myers. 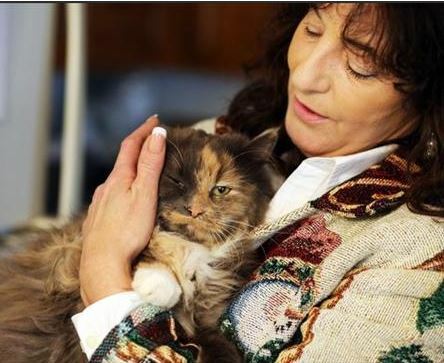 “I was so happy for her,” said Duckworth, whose own cat recently passed away. “It’s still so surreal that I’m actually touching [Mazy May] after all hope of finding her was gone,” said Cissy. The park ranger says it is amazing that Mazy May did not fall prey to any bobcat or bear, and was able to survive the winter. She thinks the cat got by eating mice and bugs. A visit to the vet at Willamette Valley Animal Hospital revealed that Mazy May lost less than a pound and weighs just over 10 pounds now. She looks well groomed and was not infested with ticks and fleas. The beautiful and fluffy Mazy May was living as a stray when she first joined Cissy Myers and her family after hanging around in their back yard for a while. Cissy says Mazy was always skittish and afraid of people. Mazy was close to her and her 7 year old granddaughter, but had not really warmed up to anyone else. Her family think Mazy’s past life living as a stray gave her the resourcefulness to survive on her own. She appears very happy to be home and is mostly unchanged, except for being less put off by the family dog, who she used to run from. Cissy Myers says this Thanksgiving was very special because of her cat’s homecoming.